We're less than a month away from DC's Universe-shaking Rebirth event, and few titles will be shaken up more than Batman. For the first time since the launch of the post-Flashpoint DC Universe in 2011, Scott Snyder won't be the writer of the monthly Batman series, passing the reins along to Tom King, best known for his work on Grayson. King, who also works on The Vision at Marvel and Vertigo's Sheriff of Babylon, will team up with Snyder to write Batman: Rebirth #1 before taking over the monthly book...while Snyder himself isn't leaving Gotham entirely. Instead, he's launching All-Star Batman with a rotating cast of top-shelf artists, telling stories that are somewhat less firmly set in the current timeline of the DC Universe. Snyder and King joined ComicBook.com to tease their upcoming Batman: Rebirth one-shot, co-written by the pair and on sale June 1 with art by Mikel Janin. You can get a first look at some pages from the issue below as well. Russ Burlingame: How did you guys end up coming together on this one-shot? Obviously you're both doing high-profile Batman launches but you're not going to be co-writing an ongoing. Tom King: How did it start? We had already, Scott and I were talking about the transition between his run of Batman and mine long before we ever knew there would be a rebirth issue and when they sort of said okay there's going to be this transitional issue, we just said, let's write it together and sort of talk at some meta-level about what it means for the story to continue. Scott Snyder: Yeah, Tom, I feel like I started showing him my stuff. The first issue was like 45 or 46, it was all the way back then, so we've been sharing work for a long time now and one of the things, he's my favorite up-and-coming writers in comics. My feeling was that we should do an issue together even if there wasn't a rebirth. Like he was saying, initially we had planned it for the issue 52 or something like that and then when they gave us the opportunity to do it for rebirth, we thought it would be fun to collaborate. Honestly, his priorities for Batman are just terrific in my opinion. I'm so excited to be passing the torch to him, in terms of the main series and it's hard when you're on a series as long as Greg and I were, to leave it and leave it in a way where you both feel secure about where it's headed and you feel invested in where it's headed and with Tom I think all of those things are more than true. He's got such a great vision for it and we're also good friends. I call him all the time about private, family stuff, I call him about work stuff. It's a doubly great feeling to know that it's in the hands of one of your close friends and he'll do a terrific job. Russ Burlingame: Scott you had a very singular vision in your book but meanwhile you've also worked with James and the rest of the team on Batman and Robin Eternal, which to me feels a little bit like it was the proto-version of what's going on in the Bat titles going forward where the world is really opening up. Has it been interesting to watch this transition where Batman is moving from being a very, very Batman-centric title to where both Batman and Detective are opening up to a larger supporting cast a little bit again? Scott Snyder: Yeah, very much. I think one of the great things is that we'd all worked together, Tom included, on the first Eternal and I think ultimately we've become, aside from being friends, I think all the people in the Bat group are pretty collaborative. When I was doing Batman, the problem with being collaborative with Eternal, even though we overlap with it, was just the speed with which it came out. That made it hard to pivot. Being on a monthly book, and being involved in some of the stuff that is coming in the Bat world too, it's a joy to see the books open up and, I know that Tom has a very, very singular vision for Batman so the characters in the story are deeply about Bruce and Gotham in ways that I think are really going to inspire people and excite people. It's always great to see more crossover between characters like Duke Thomas and seeing Batwoman in Detective and what's going on with some of the Robin characters and all that stuff so...yeah, we're a pretty collaborative group, I think, all around. Tom King: Yeah, the last one went, last Tuesday we had a little party, we're like, all right, good, they're all gone. Now we can move forward. It's crazy, but I'm lucky enough just to make this a love-fest. Scott had to take over this book from Morrison so I have a friend who I work with, who's gone through this exact same thing. It's nothing but intimidating, it's nothing but scary but Gotham is a scary and intimidating place so you just got to take those emotions and put them right on the page, you know? 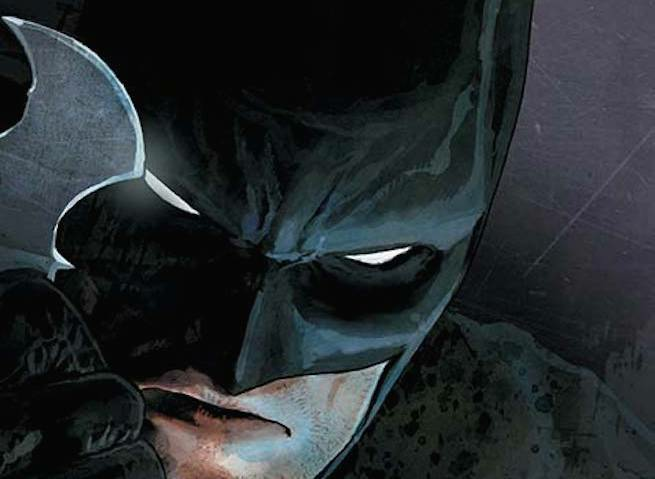 Russ Burlingame: Now we've known just a tiny bit about the direction that the post-rebirth Batman is going to take. What can you tell us about how this one shot kind of sets the stage for everything that comes after it? Tom King: A lot of comics, at least to me, it's about sort of creating tension and then returning back to a place of calm so that you can build tension again. The brilliance of Scott and Greg's run is how much they were able to break all the toys and put them back together again so that we could play with them. Rebirth #1 is setting us in a place where you see that Batman is back to the classics, to what you remember, to the cave, to Alfred, to all of that stuff, and to see how coming back to the classics connects to Scott's run and connects to mine and how that all emerges together. I think that's the point of the issue. Russ Burlingame: Now, talking about breaking all of the toys...Scott, can you confirm for us that Alfred has his actual hand back? Scott Snyder: It is in fact Alfred's hand, as much as we like torturing Alfred with the thought that it might not be it is. It is his hand. Unless somebody in the, honestly though, if somebody in the Bat group was like, "I have an idea for that hand: alien symbiote!" I would be like, "Go for it!". Tom King: I never told you: it's Aquaman's hand, it's in the second arc. Scott Snyder: That would be amazing, that would blow everyone away, it's like the water spear? Russ Burlingame: Now, we've seen this new, kind of adversary for Bruce that's gonna be popping up in your book. Are we gonna see them teased in the Rebirth book or is that really after you get the book all to yourself and it's in Batman #1? Tom King: Do you mean this mysterious Gotham, Gotham Girl that appear on the cover? These two superhero-looking people? Russ Burlingame: Well, it's a fair question! When I talked to Ben Percy this morning, he told me about characters that are on his Green Arrow Rebirth cover that down show up until the second arc because the covers are teasing the new status quo. Tom King: It is a hundred percent a fair question. Yeah, those two characters, they'll appear for the first time...their story will be told in Batman, starting in Batman #1. Rebirth is about who Batman is as a character and what it means for a character who's not really broken to enter this new DCU and we're focusing on sort of the deeper themes of that and two huge threats that threaten Gotham and what Batman does and he's going into another threat and what that means. That story itself we told in Batman. Russ Burlingame: One of the big things that Scott did early on was to introduce this concept of the Court of Owls and that Batman didn't know Gotham as well as he thought he did and that was a real way of shaking up his status quo. As we're heading into Rebirth, now we have all this new stuff going on in the DC universe but by way of what's going on in Justice League, Batman is learning about the pre-Flashpoint Superman and he's really kind of getting this perspective that he's not, as much as he was the god on the Mobius Chair last month, that he doesn't know everything. Is that going to kind of help shape the direction of your early stories too? Tom King: Actually, yeah. A lot of my stories are about Batman's mortality. To me that what makes Batman interesting or makes him sort of unique in the DC universe is that he's like us, he can die, he can sacrifice himself. He's not Superman, he's not a god. He's just doing the best he can with his will and his wits. Yeah, that concept of Batman as not a god, as not being omnipotent will play a central role in the whole thing. Russ Burlingame: What is the biggest thing -- I'll ask each of you this because obviously you both are kind of taking different elements of the Bat forward with your new Rebirth books. What's the biggest thing that each of you has picked up from the other one that you can carry forward into Rebirth as you shape the future of this character? Scott Snyder: I would just say, talking to Tom, I think one of the things that I would point up as unwaveringly true is that guy is just an unflinchingly honest and brave writer and it's what attracted me to his stuff back when he was doing Grayson. But then when he started Vision and Omega Men and Sheriff of Babylon, he really is proved, right now I think my favorite, current writer. Tom King: Aww! And you're my favorite, current writer. Scott Snyder: I'm honored to have him next to me with this and I look up to him as a writer, I really do. I ask him all the time, "is this issue good enough, how do I ...". He's the first person I sent All-Star to after I finished it -- him and James Tynion. For me, if there's anything that I've learned from him in general, as a writer, it's that reminder that great stuff comes from being brave on the page and to put yourself out there and to make that you write these characters that have been around a long time like you've made them up and that they're about things that keep you up at night. That's one of the reasons I enjoy talking to him and working with him so much is that I what makes him such a great writer, I honestly think he's my favorite right now, is just that he's not afraid, or at least hides being afraid, to put himself out there in this character and I think that's what really makes some of what happens in this first arc special too. He makes Gotham a place that's very dark and very much kind of a war zone in a way and I can see echoes of what interests him in his other work in this. The gray moral areas of battle and I love his work is here, in this. That to me is the thing that I think really attracts me to his work and makes me, also sort of keeps me honest, when I see that stuff. I was talking All-Star with him early on and going back and forth about how he was going to keep Batman something that was really personal and his that also made me realize I had to try something very different than my initial draft with All-Star too. I'm very, very grateful for having become both good friends and partners in Gotham. Sorry, that was a total long-winded answer but...true. Tom King: Now I get to long-wind, sweet. I think I learned from Scott's stakes on two different levels. I've learned everything from Scott but let me focus on two things. Stakes in a comic book, on a very how-to-write-a-story level, if you look at a Snyder story, what happens in there, it feels real to you. You feel like these characters are in danger, you feel like this world is about to burn and because you feel that way, you get sucked into the story and it becomes real to you and instead of reading a comic book, you're actually walking the streets of Gotham and you're with Batman and you're behind him. I think nobody does that better in comics, maybe in the history of comics, than Scott Snyder. Then, on a meta-level, I know a lot of people, in the history of this industry, who never took it seriously, who thought of comics as just a way to get a paycheck and Scott doesn't feel that way. He puts himself in his work and he risks a lot to make a comic as good as he can possibly make it, not to do a side project, not putting myself out there so that if something goes bad, if it doesn't work, it doesn't hurt him. He's willing to take the blows because he knows he puts his all into it and I think if you're going to write great comics, like he does, you have to do that. Stakes on two levels. Scott Snyder: Thanks dude, I appreciate that.